Michael and Diane Porter wrote the following article, which also appears in the January, 2012, Bird Watcher's Digest. The review evaluates and compares 29 8x42 binoculars with street prices of between $200 and $600. This review of the Kowa SV42 is part of that review. 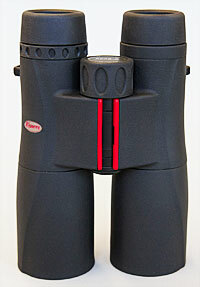 This new Kowa SV42 binocular is long and slim, with a pleasant armored covering. It’s hand friendly. The slender, contoured barrels make it especially comfortable for people with smaller hands. The focus knob turns 1 ¼ turns lock to lock. The eyecups twist up, with intermediate clicks. With its overall score of 4.17, the Kowa SV42 came in 11th out of the 29 8x42 binoculars we compared. Yet, at $210 it’s one of the least expensive binoculars in the study. Pro: Long 19.5mm eye relief; low price; good ergonomics; good value for a low price. Con: Rather narrow field of view of 330 feet; minimum focus distance is 13.1.